The adoption rate of value-based payment models in Medicare has been slow and providers hold the CMS partly accountable. For providers to be successful, financially risky models need to be predictable. 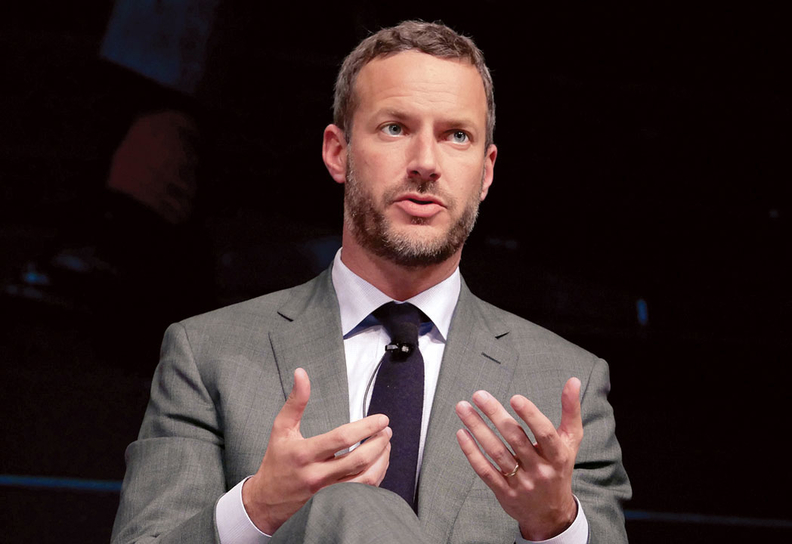 That often isn’t the case for models coming out of the Center for Medicare and Medicaid Innovation, a group of stakeholders led by the National Association of ACOs wrote in a letter last week to CMS Administrator Seema Verma and CMMI Director Adam Boehler. The CMMI doesn’t currently ask for public stakeholder input before launching new models. It’s also not uncommon for changes to be made to models in the middle of performance periods. “Our concerns are heightened by the fact that we are moving to more at-risk models and when the providers are signing a contract that puts their balance sheet at risk. … If you have not been part of the process you are reluctant to do that,” said Clif Gaus, CEO of the association. A CMS spokesperson said the agency received the letter and appreciates the input from stakeholders. The spokesperson added that CMMI "regularly" asks for feedback on payment models through requests for information, listening sessions and meetings. But at the annual HIMSS conference in February, Boehler acknowledged that the agency needs to work on improving the stability of the models. Despite all the buzz about the transition to value-based payment in recent years, actual adoption isn’t widespread. In a recent survey of more than 500 C-suite executives from consultancy Numerof & Associates, 66% responded that less than 20% of the total revenue at their organizations was tied to risk-based agreements. Just 6% had more than 80% of their total revenue tied to risky contracts. Not surprisingly, the executives surveyed listed fear of financial losses as the biggest reason why they have been hesitant to take on the models. 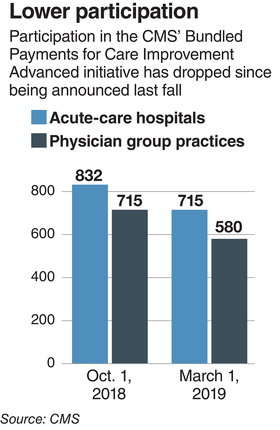 That fear most recently played out when CMS late last month announced a 16% drop in the number of participants for the Bundled Payments for Care Improvement Advanced model. Some providers were critical about how prices were set, and the possibility that they could be on the hook for losses likely explained the dip in participation, said Dave Terry, CEO of Archway Health, a company that works with providers on bundled-payment initiatives. More participants likely applied to the program even if they weren’t ready to take on the level of risk required to get a little bit of experience with the bundle and access to the 90-day data that providers usually aren’t privy to, he added. Providers could exercise a zero-risk withdrawal option in March, just five months after the program started, to account for a delay in correct data. “There were a lot of practices that moved forward that frankly we wouldn’t have recommended to move forward if they didn’t have the option to drop off,” Terry said. The 16% dropout was lower than Terry expected. “My fear is there weren’t more drops because people weren’t looking at the data much—there might be some unpleasant surprises,” he added. Another complaint against the CMMI models has been sudden changes in the middle of performance years. Last year, seven Next Generation ACOs left the program after the CMS unexpectedly announced a change to the risk score that likely left them on the hook for millions in potential losses. “It is all about the stability of the program and the predictably of the program—that is at the heart of whether someone joins or whether someone stays,” Gaus said. At Froedtert & the Medical College of Wisconsin, the system is currently weighing whether or not to participate in the Medicare Shared Savings Program, which isn't part of CMMI but a Medicare program. The Milwaukee-based health system currently participates in BPCI Advanced and Medicare Advantage. Dr. Jonathon Truwit, Froedtert’s chief medical officer, said working with Medicare Advantage plans is predictable. He can expect to get the clinical data every three months. He’s heard that CMS data sometimes has lags or can be as old as six months. With Medicare Advantage, “I know what levers to pull and not pull. With CMS, it’s guesswork. They can’t provide the information as quickly,” he said. Medicare’s ACO program is appealing because Froedtert has a greater potential for bonuses than Medicare Advantage, but there is also the possibility for losses, which Froedtert doesn’t have to worry about with MA plans. Right now, Froedtert is evaluating its data to see if it can benefit over the long term from participating in MSSP. They have until the summer to decide if they want to begin the program in January 2020.